That candy floss in the valley over the Five Mile Baptist Church again.. ....I just can't seem to get enough of it. It seems there have been more foggy mornings this summer than I can ever remember. The sort of morning when you really don't want to bump into them. That's right, dear, nice and slow across the road. The mornings are cold now, almost frosty but someone's been working hard. Blue and white are August colours. This was on the Allegheny River Trail in town, right by the traffic of the incongruously named Constitution Avenue. (For all its grand moniker it skirts Walmart and some railway yards.) If only I'd come early in the morning when the sun was on them. 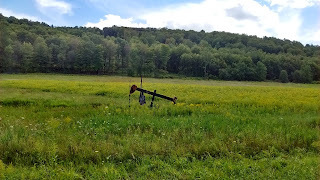 An old oil well sits in a meadow, a remembrance of things past.